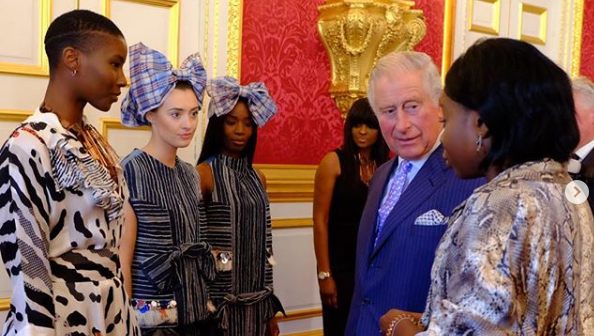 Prince Charles hosts Nigerian fashion designers. Ahead of his West African tour, Prince Charles hosted a reception for British-West African creatives including two Nigerian fashion designers. Prince Charles and his wife, Camilla are expected to tour Nigeria, The Gambia and Ghana starting from October 31 up till November. Ahead of his West African tour, the Prince hosted a reception for British-West African creatives including two Nigerian fashion designers. The designers, Eki Orleans and Nkwo Onwuka, will showcase their works at the ongoing Lagos Fashion Week. The reception details was shared on Prince Charles and Princess Camilla’s official Instagram page @Clarence House. “Ahead of the Prince of Wales and the Duchess of Cornwall’s visit to The Gambia, Ghana and Nigerians, Their Royal Highnesses hosted British West Africans from areas including media, sports, fashion, the arts, education and charity. “Their Royal Highnesses were introduced to models showcasing stunning designs by @ekiorleans and @nkwo_official at the Lagos Fashion Week,” Clarence House said. Reacting to the reception, Lagos Fashion Week through its official Instagram page @lagosfashionweekofficial expressed gratitude at the opportunity provided by the royals. They said, “As Lagos Fashion Week begins today, we were given the opportunity to highlight the work of our platform. The designers showcased are a reflection of our ethos. “Nkwo, whose designs are made in Nigeria from end-to-end, with fabrics locally sourced from communities in northern Nigeria. “Eki Orleans, who was born in a rural town in Germany, was raised in Nigeria and now resides in London. “Her designs are deeply rooted in Africa and are a celebration of the links between Nigeria and the UK,” Lagos Fashion Week wrote. The ongoing Lagos Fashion Week will feature runway shows from Nigerian designers and runs till Oct. 27. Liked this story? Share with friends and family.